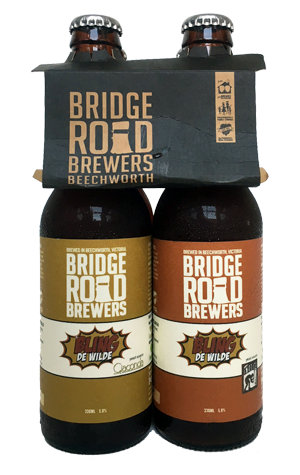 Bridge Road Brewers put out a phenomenal amount of beers each year – especially when you consider how many of them are released in bottles as well as on tap. Many of them are experimental, with the brewery exploring new techniques, ingredients, hybrids and the like, in part to see how they turn out but also with an educational aspect; their single hop IPAs can help people understand the characters of different hops, for example; releases like this offer insight into how different yeasts, bugs and barrels can affect a beer. In this case, the starting point is the brewery's IPA, Bling. The original beer (included in the four-pack) is closer to a red IPA than most IPAs on the market today, with a hearty, toffee like malt character going toe to toe with the hops. And it becomes a trio of Bling De Wildes by virtue of being fermented with wild yeasts from three High Country wineries: Sorrenberg, Giaconda and A Rodda. The three beers that result highlight how different strains can take beers in different directions. If there's a common thread between them, it's that much of the sweetness has been stripped from the original Bling across the board. And, if there's a second common thread, it's that all three would likely work better as part of a blend, added to a more straightforward base beer to add complexity. Why? Because, as standalone beers, they're pretty challenging: an experiment that's educational and interesting more than one you're likely to buy by the case. The Sorrenberg variant is arguably the beer that's furthest from the original Bling: there's a nuttiness there, but also flavours and aromas that bring to mind a bitter that's been left out in an old English pub. The beer featuring yeast strains from A Rodda possesses a funkiness on the nose, as well as a Brettanomyces like dryness and a sharper carbonation than the original. As for the Giaconda spin, it leaves in a little more of Bling's sweetness alongside a lean, dry bitterness and offers up some herbal, dark licorice / anise characters too. Sampling them brought to mind a recent Crafty Cabal event, Wild Blend at Tallboy & Moose, as you could have fun blending the Bling De Wildes into other beers – quite possibly more than you would drinking them straight.